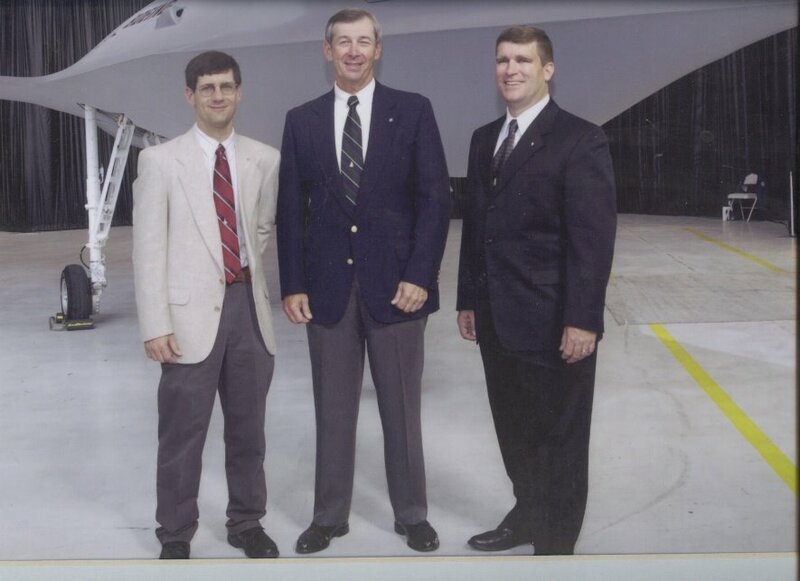 On Oct. 18, 2002, Boeing uncloaked its secret Bird of Prey during a rollout ceremony at the company's facility in St. Louis. 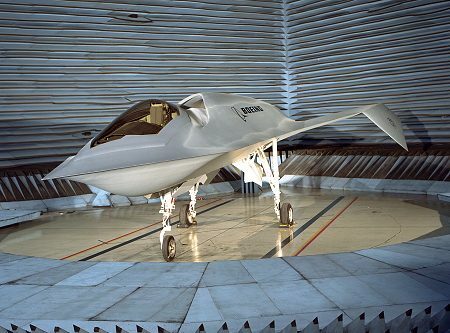 Named for a spaceship in the science fiction television series Star Trek, this technology demonstrator pioneered revolutionary advances in low-observable (stealth) features, tailless aircraft design, and rapid prototyping techniques. The project, initiated in 1992, remained under wraps even after its conclusion in 1999. A Boeing spokesman announced that it had been declassified "because the technologies and capabilities developed [during the program] have become industry standards, and it is no longer necessary to conceal the aircraft's existence." Underscoring the importance of the event was the presence of Air Force secretary James Roche and Gen. John Jumper, the two top Air Force leaders. 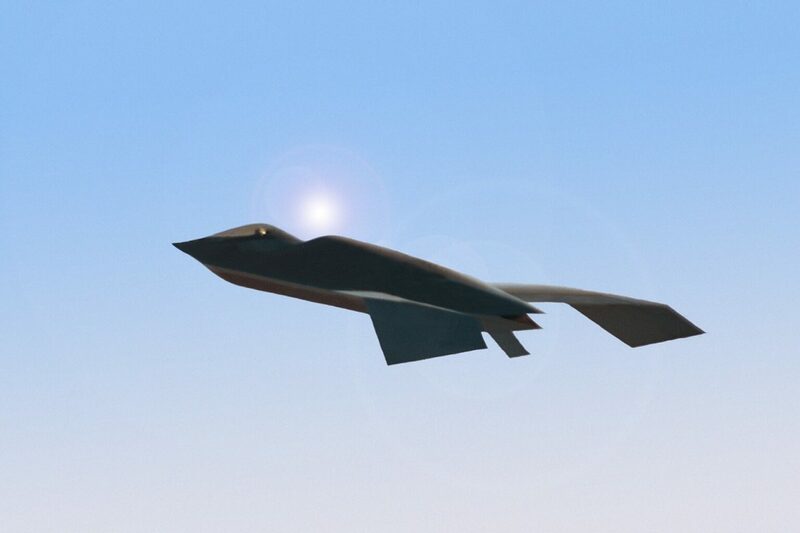 "Early investments in technology demonstration projects such as Bird of Prey have positioned Boeing to help shape our industry's transformation," said Jim Albaugh, president and CEO of Boeing Integrated Defense Systems. "With this aircraft, we changed the rules on how to design and build an aircraft, and what we've learned is enabling us to provide our customers with affordable, high-performing products. Projects such as Bird of Prey have provided the catalyst for integrating speed, agility and reduced cost into the processes we employ to introduce new commercial and military systems to market." Only three pilots flew the Bird of Prey: Rudy Haug (McDonnell Douglas/Boeing), Lt. Col. Doug Benjamin (USAF) and Joseph W. Felock III (Boeing). 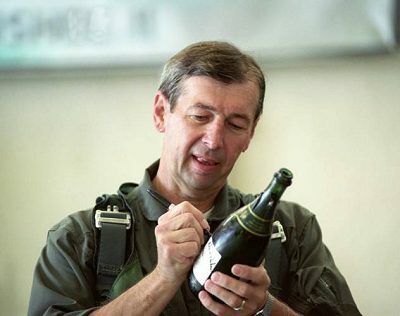 Haug was originally assigned as the back-up project pilot but when primary project pilot Fred Madenwald resigned following high-speed taxi tests, Haug took his place. He piloted eight flights including the first in the aircraft's final configuration. Benjamin, commander of the Bird of Prey Combined Test Force, was next to fly the exotic craft. He developed profiles for technology demonstration flights and piloted 21 sorties for performance envelope expansion, as well as the airplane's final flight. Felock flew nine sorties, overcoming numerous challenges posed by the airplane's performance and flying qualities limitations. "It was a great program," he said, "but I was glad when it was over." 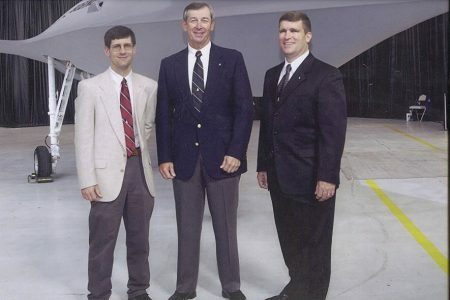 In September 2007, the three men received the prestigious Iven C. Kincheloe Award from the Society of Experimental Test Pilots in recognition of outstanding professional accomplishment during the conduct of flight-testing. The 47-foot-long, subsonic, single-seat airplane featured a tailless configuration with drooped wingtips spanning just 23 feet. It weighed nearly 7,400 pounds and stood nine feet high. 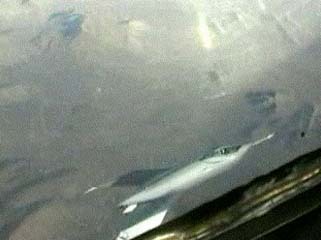 The cockpit was unpressurized and the engine inlet was located just aft of the pilot's canopy. The engine was the same type used in the Cessna Citation business jet and the main landing gear included modified components from Beech King Air and Queen Air twin-prop commuter aircraft. The pilot's ejection seat and the emergency landing gear blow-down bottle were taken from a McDonnell Douglas AV-8B Harrier. 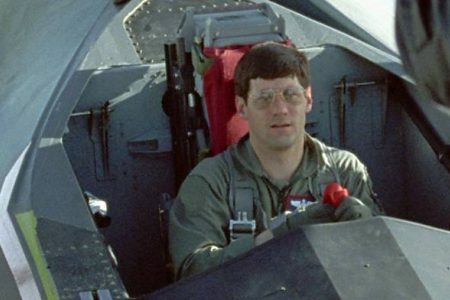 The control stick and throttle were scavenged from an F-18 Hornet and the rudder pedals from an A-4 Skyhawk, both McDonnell Douglas aircraft. A Grumman Gulfstream II business jet provided elevon actuators, wheels and tires. General-aviation type cockpit instruments were considerably less expensive than similar equipment built to military specifications. According to Air Force test pilot Doug Benjamin, "the clock was from Wal-Mart and the environmental control system was essentially a hair dryer." The Phantom Works team further reduced costs by using the actual airplane as a static test article for loads and structures testing. At one point it was raised on jacks so the landing gear could be cycled hundreds of times to test the system's numerous micro-switches and mechanical components. After about 750 cycles, an aluminum drag brace on the main gear strut suffered structural failure during extension. Technicians determined the failure was caused by a combination of excessive cycling and preloading of the over-center lock. As a precaution, both drag braces were replaced with new ones made of steel, adding more structural weight. During high-speed taxi testing, the airplane was equipped with fixed drag braces. Phantom Works chief test pilot Rudy Haug was the first pilot briefed into the proprietary program. During his initial briefing he studied a model of the airplane and began to have serious concerns. He demonstrated these by folding a sheet of paper into an aerodynamic shape with downturned wingtips. He then tossed the glider across the room and watched as it immediately rolled on its back and landed upside down. 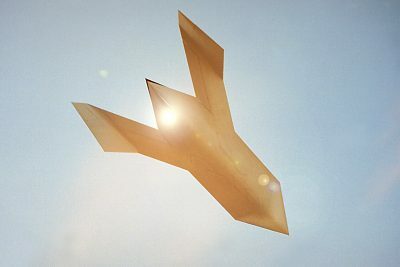 Based on computer simulations and wind-tunnel model tests, the designers assured him the real airplane wouldn't do that. The Bird of Prey was transported by cargo plane to the Air Force Flight Test Center's remote operating location at Groom Lake, Nev., and readied for testing. Haug would perform initial contractor testing while Air Force tests would be flown by a pilot from the Special Projects Flight Test Squadron at the test site. After the merger with Boeing another contractor test pilot joined the program. For static engine testing the Bird of Prey was anchored to instrumented tie-downs. Initial runs revealed inlet flow distortion that became a significant factor in determining the airplane's thrust-to-weight ratio. The inlet geometry prevented airflow from passing directly to the compressor face, resulting in serious inlet losses and thrust degradation. During tests at 75-percent thrust, airflow separation in the inlet caused the engine to suffer compressor stalls. "At the time, we weren't sure if this was due to low thrust, high aero drag, high ground effects, or higher rolling friction. We eliminated the rolling friction possibility by performing a unique test. A rope was attached to the Bird of Prey and connected to a fish scale. A second rope was attached to the fish scale, and the airplane was pulled along at a walking pace, with an engineer noting the force being measured with the fish scale. The force was about 90 pounds, which was very close to what was being used in the takeoff acceleration predictions." The results of the high-speed taxi tests indicated performance loss was relatively constant compared to aircraft speed and probably didn't result from aerodynamic drag. Because of uncertainty in the data, flight planners computed a best-case climb performance with a three-percent thrust reduction. They also calculated a worst-case scenario assuming a nine-percent performance reduction due to aerodynamic drag in the gear-down condition. Based on these calculations the team established a first-flight maximum weight/temperature combination that would provide just enough performance for a safe climb-to-pattern altitude. This would give the pilot sufficient margin to maneuver for an emergency landing or safe bailout if conditions warranted. In preparation for flight-testing technicians fitted the Bird of Prey with a nose boom to collect air data during the first six flights. The instrumented boom provided information on airspeed, altitude, angle-of-attack and sideslip. A nine-square-foot ventral fin was added toward the airplane's aft end to improve directional stability. It remained on the airplane during the first seven flights and enabled the Bird of Prey to match its computed stability derivatives. Unfortunately, it also prevented the airplane from operating within parts of the flight envelope necessary to complete the technology demonstration objectives. 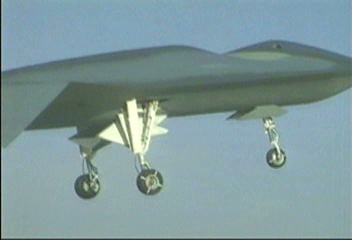 Haug piloted the maiden flight on Sept. 11, 1996, leaving the landing gear extended throughout the flight. The short hop revealed the airplane had marginal gear-down handling qualities due to excessive drag, nearly three times greater than predicted. Flight-test results indicated about half the drag increase was caused by the open wheel-well cavity. Phantom Works engineers had conducted most of the wind-tunnel testing and CFD simulation with the airplane in gear-up configuration to predict operational performance and stability derivatives. They derived an aerodynamics database from approximately 100 hours of low-speed wind-tunnel testing using a fairly crude 15-percent-scale model that lacked such details as inlet, exhaust or gear wells. To reduce drag on subsequent flights aerodynamic fairings, nicknamed "Cadillac fins," were added to the main landing gear struts. During the first flight Haug also found the Bird of Prey had marginal stability in pitch and was unstable in roll and yaw. Directional stability was particularly poor at low angles of attack (AOA). These characteristics had a significant impact on the airplane's basic flying qualities. With only one flight under their belts Phantom Works engineers had little flight data to work with, but what they had didn't match the predicted lateral-directional stability derivatives and simulator performance. A second flight yielded similar results. "To counter this characteristic, the gearing between the elevon and rudder (Aileron-Rudder Interconnect) was purposely increased to counter the yaw caused by the negative Cnp. This sounds good, but when the roll command is first applied, the roll rate is zero, which means the adverse yawing moment due to the negative Cnp is zero." According to Benjamin, "The yaw motion eventually built to a point where the proverse sideslip it produced fed into the dihedral effect, and caused the aircraft to roll even faster just about the time the pilot was trying to check the roll." The relative time delay between the roll caused by the pilot's application of the elevon and the roll produced by the yawing motion caused the overall roll motion to be out of phase with pilot inputs. This resulted in a mild pilot-induced oscillation. The gear retracted without apparent difficulty. On extension, however, the pilot's instruments indicated the main landing gear was not fully down and locked, and the gear sequence stalled with the nose gear still up and locked. In this configuration Haug couldn't land because of the flight-test boom installed on the airplane's nose. Engineers predicted the boom would break off and impale the pilot. Haug used the alternate gear sequence panel to bypass the main gear micro-switches and extend the nose gear, allowing a safe landing. 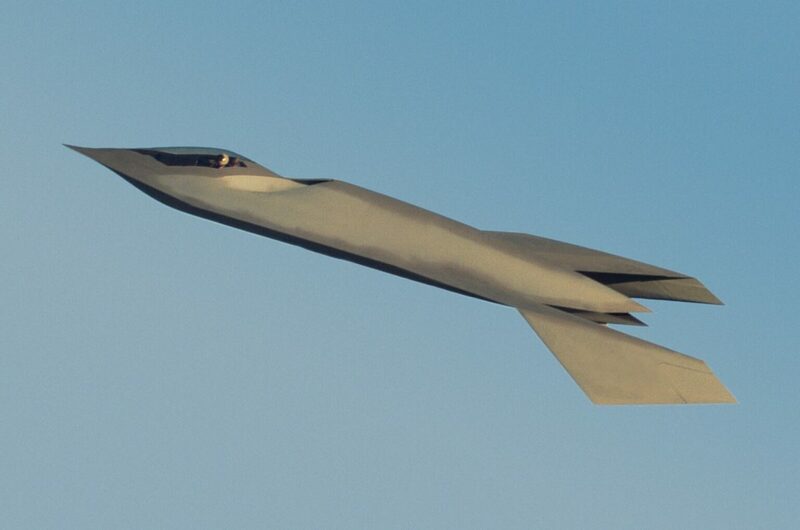 These initial flights demonstrated the design's airworthiness and paved the way for performance envelope expansion and low-observables testing. The airplane was soon flying at design speed and altitude. 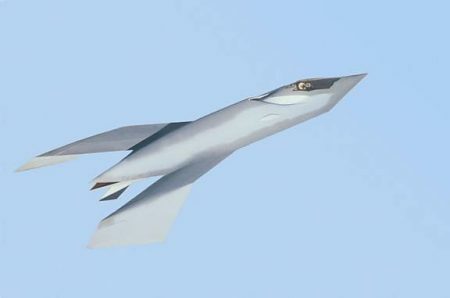 The Bird of Prey incorporated a variety of stealth features to minimize radar, infrared, visual and acoustic signatures. 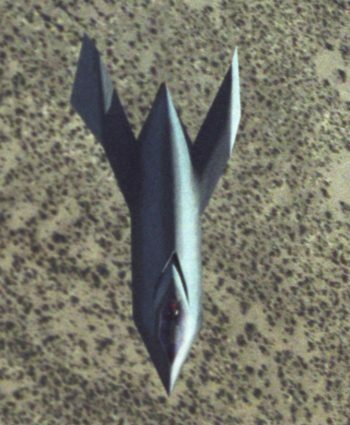 The overall shape of the low profile, tailless, blended fuselage with sharply cranked aft-set wings contributed to an extremely low radar cross-section. Flexible covers concealed gaps between fixed structures and moveable control surfaces. Designers were careful to ensure edge alignment on the canopy, landing gear doors, wings and fuselage to minimize radar backscatter. To eliminate radar reflections from the engine compressor face, the powerplant was buried deep in the fuselage and hidden behind the canopy and a curved inlet duct. The engine exhaust mitigated the airplane's acoustic signature. A paint scheme consisting of several shades of gray reduced the visual contrast of shadows from various parts of the airplane. All of these features would contribute significantly to the survivability of an operational combat airplane. The Bird of Prey's unique configuration significantly affected its flight performance. Although it looked like a futuristic fighter plane it had a thrust-to-weight ratio more like that of a cargo aircraft, but with a much smaller wing area. In fact the Bird of Prey had a reference lifting area of just 366 square feet, including the blended body. The fuselage carried over half the load, resulting in approximately 20 pounds of wing loading per square foot. Although it had a design cruise speed of 260 knots, the Bird of Prey achieved a maximum speed of 287 knots on one sortie. The airplane's overall performance was limited by poor lateral-directional stability at low AOA, but it improved dramatically when the landing gear was retracted. The airplane had a peak climb performance of approximately 3,000 feet per minute, and up-and-away drag was slightly lower than predicted. As soon as the nose wheel lifted off the runway, lack of resistance from the centering spring combined with the wheel's center of pressure caused the wheel to deflect all the way to the left, inducing a sudden yaw. The test was immediately aborted and, fortunately, the nose wheel centered itself before touching down. Had it not, the nose gear might have snapped off or at least suffered severe damage. The problem was traced to the airplane's irreversible flight controls and the King Air landing gear. The hydraulically powered rudderons and the centering spring provided insufficient force to keep the nose wheel centered. This design flaw, it was later determined, resulted from inadequate CFD modeling of the nose wheel, which had predicted the wheel's center of pressure to be forward of the pivot. Unfortunately, these changes resulted in a turning radius of nearly 100 feet, even with maximum differential braking and engine thrust. To assist the pilot in making sharp turns the ground crew devised a special tow bar that could be attached to the nose wheel to pivot it manually from outside the airplane, an operation that became known as "Steerman." "When I first saw the airplane," said Joe Felock, "I thought it would be a rocket." First of all, Doug Benjamin noted the importance of getting input from the test pilots early in the program, during the design phase. "This involvement saved a lot of problems before they became crises," he said, adding, "The design team was pleasantly surprised at the involvement and flexibility of Flight Operations [personnel]." 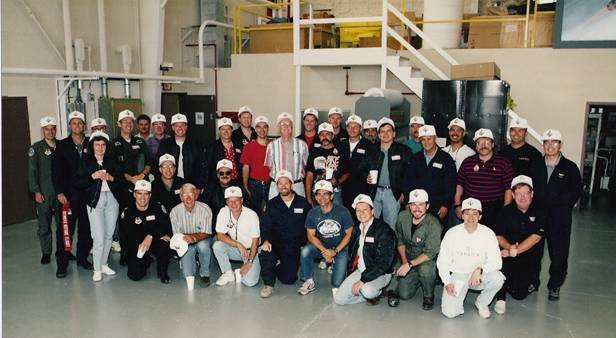 Because the project was supported by a highly integrated team, personnel were interchangeable in a variety of jobs. "The program could not have been accomplished without team members substituting for each other at multiple locations and various times," Benjamin said. This proved especially true as McDonnell Douglas machinists staged a strike shortly before the first flight. In order to meet schedule requirements, engineers and other Bird of Prey team members were forced to place themselves in roles outside their normal job descriptions. Since, according to Benjamin, "they had literally surrounded the airplane as it was being designed and built, they had more knowledge than the standard design engineer who designs a part and passes it over the fence, never seeing how it is produced, installed, operated or maintained." "This program really needed the 'A-team' from start to finish," he said. "Some of the problems experienced in the program were the result of decisions made earlier that the 'A-Team' wouldn't have allowed to happen but then had to live with." He also advocated for not blindly adhering to all military standards. Although he acknowledged these provided important guidelines, Benjamin insisted it is possible for program management to accept increased levels of risk "if the overall design is driven by effectiveness and safety." Benjamin said the aircraft was very well built, resulting in a heavier weight than desired. 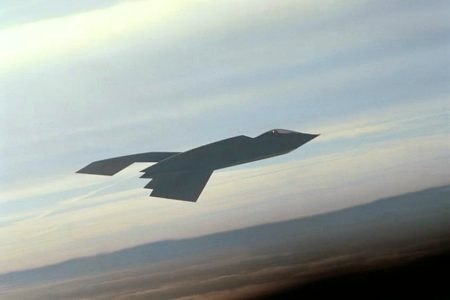 He suggested this might have resulted from the flight vehicle doing double duty as a static test article and acknowledged that it contributed to the airplane's performance problems. Previous McDonnell Douglas projects, such as the F-15 and F-18, had relied heavily on flight simulator experience. First-flight pilots for these programs commented that, "it flew just like the simulator." Rudy Haug's greatest disappointment during Bird of Prey's maiden flight was that it flew nothing like the simulator. As the team collected flight-test data, they updated the modeling software and the simulator became a valuable tool. 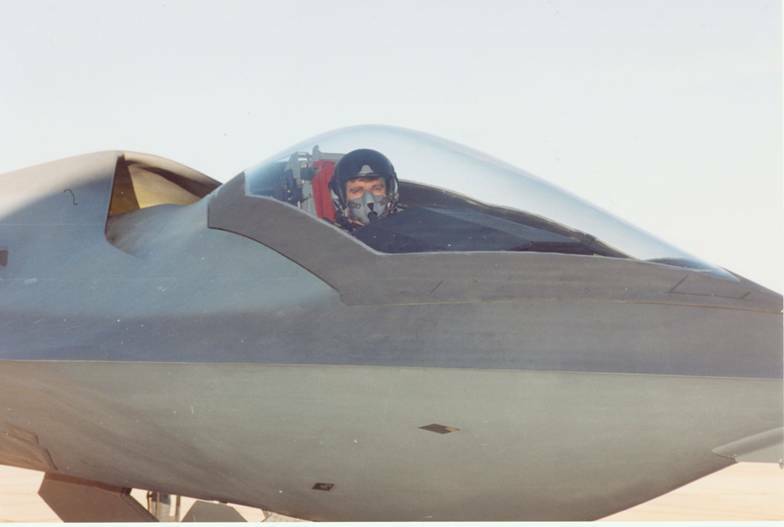 The test pilots used it to practice missions and maintain proficiency during long breaks resulting from aircraft modification and weather delays. 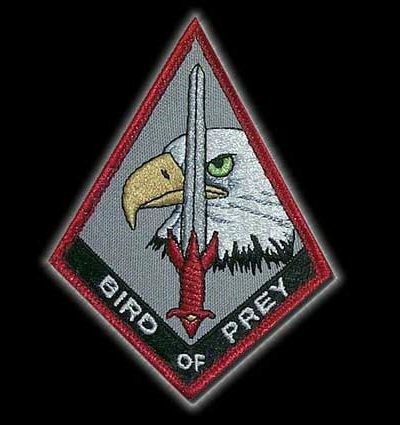 "The Bird of Prey was a high-risk, high-payoff program that expanded the boundaries of what was acceptable to demonstrate new technologies," Benjamin said. "We showed it's possible, within a limited budget, to conceive, design, build and test a state-of-the-art low observable technology demonstrator." 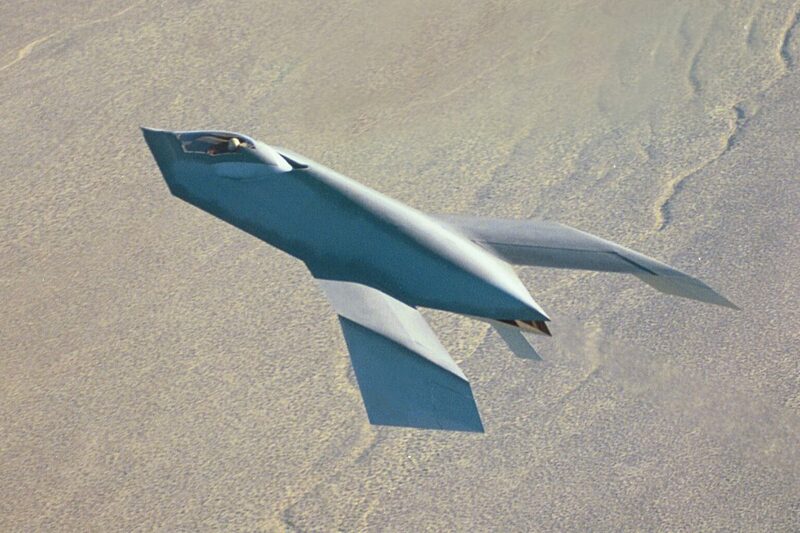 Development of the Bird of Prey was parallel and complementary to that of the company's X-36 unmanned tailless demonstrator. The X-36 program was carried out at the NASA Dryden Flight Research Center at Edwards, Calif., in a largely "white world" (unclassified) setting with some restrictions regarding proprietary information. 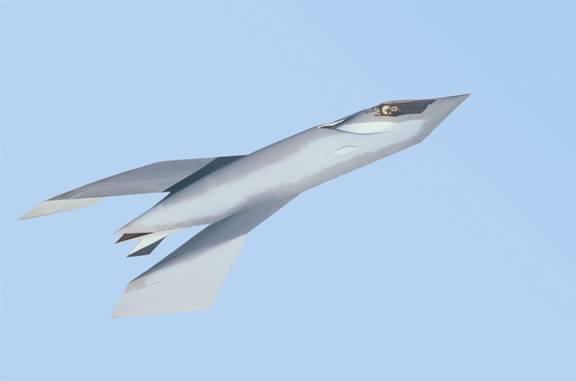 It was primarily aimed at validating technologies that McDonnell Douglas (and later Boeing) proposed for early concepts of a Joint Strike Fighter (JSF) design. 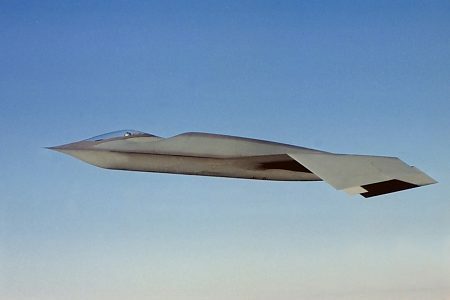 Observers will note a distinct family resemblance between the X-36 and the Bird of Prey. 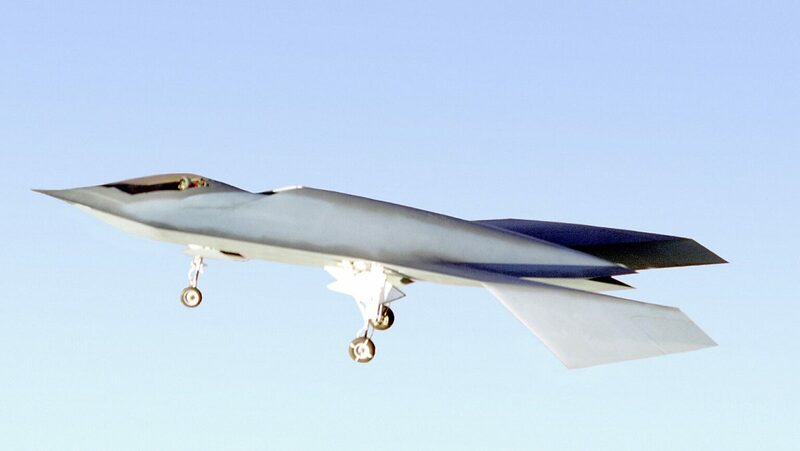 Similar characteristics were incorporated into the Boeing X-45A Unmanned Combat Air Vehicle (UCAV) technology demonstrator tested at NASA Dryden between November 2000 and August 2005. For the tailless X-45A, Boeing engineers drew directly from their experience with Bird of Prey. 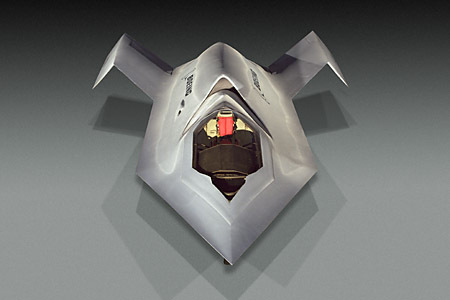 Some aspects of the UCAV's innovative radar-evading design, such as its shape and inlet configuration, were developed from this project. 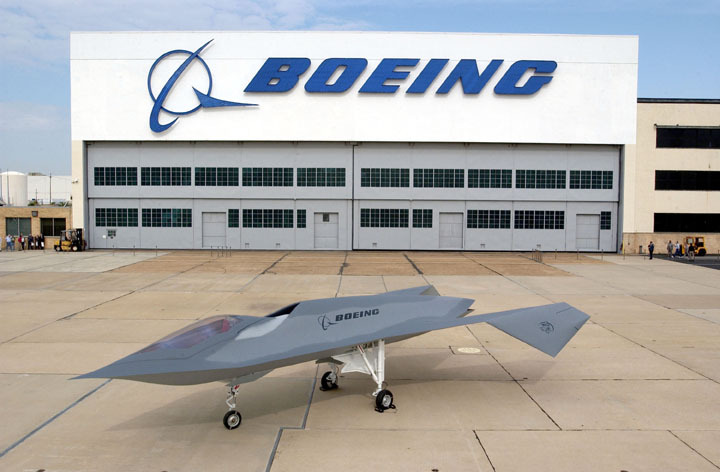 Manufacturing technology developed for Bird of Prey was applied to Boeing's X-32 entry in the JSF competition. For that program, Boeing wanted to stress new design and production methods that would greatly reduce the cost of manned jet fighters. "The success of the Bird of Prey is a testament to the shared commitment of Boeing and the Air Force to pioneering innovative methods to drive down costs and improve performance," said George Muellner, senior vice president of Air Force Systems for Boeing Integrated Defense Systems. "This project stressed affordability as much as performance and quality, and is one of many that we are using to define the future of aerospace."